I met Janet Courtney in 2015 through a small working group that was exploring the feasibility of creating an interdisciplinary, international conference on touch. On so many levels I find her amazing. She is an internationally recognized expert in developmental play and attachment therapies for children and gave a wonderful TedX talk on the importance of childhood touch. 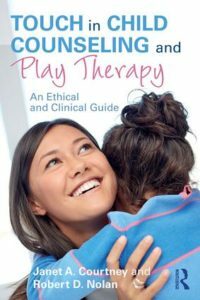 Janet was in the process of writing and editing an academic textbook called Touch in Child Counseling and Play Therapy: An Ethical Guide. A lifelong touch advocate, she was surprised to discover that nobody had written a text for professionals about the crucial role of therapeutic touch for children. 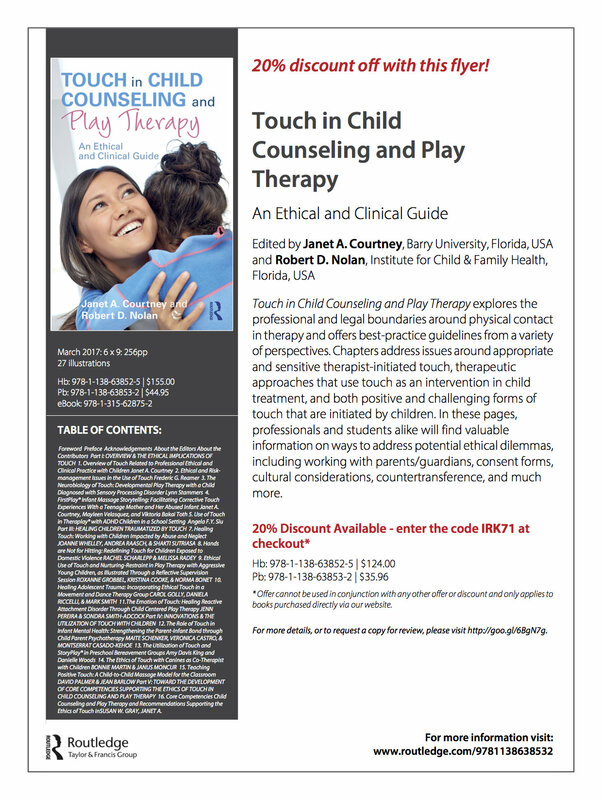 At her invitation I co-authored a chapter entitled Teaching Positive Touch: A Child-to-Child Massage Model for the Classroom with Jean Barlow, another hero of mine whose program was profiled in the chapter. The book was published in March, 2017 and for the launch, check out the promotional discount Rutledge Press is running: 20% off the price of the hard or softcover versions of the book. The eBook version is also available at Amazon. If you are affiliated with a massage school, you may be able to preview the eBook version for free by filling out their Complimentary Copy form. This textbook is a first in its field and my contributing an academic chapter is also a first. When it was done in May 2016 I felt like I had run a marathon with the same finish line exhilaration and craving for more. Thank you Janet and Jean for challenging me and including me in your lives and ground-breaking work. This entry was posted in Touch and tagged book, Janet Courtney, touch. Bookmark the permalink.